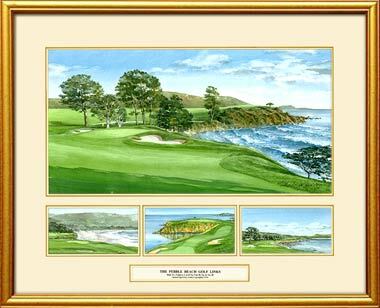 Golf Art - Major Championships " var s5 ="
" var s7 =" Click anywhere on this image to return to the previous page" var s8 ="
The Major Championship and Classic Course Series are available as ORIGINALS and LIMITED EDITIONS. 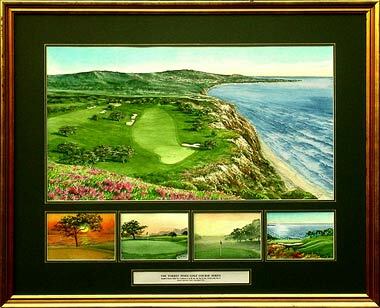 Each Series consists of one large painting and four smaller images, which depict the character of the course as well as the most memorable scenes. An optional sixth image depicts the routing of the golf course. Click here for Prices & Order Form. New York, NY, or Golf Art. The originals are matted in dark green and French lined in gold, unframed. The gallery offers custom framing, nominal size of 33”x27”. 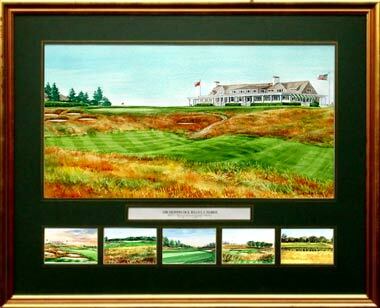 The Series Limited Editions are available from your local golf professional rep for Golf Art. Click Contact above for the address of the representative. Each limited edition consists of 60 signed and numbered paintings, with gold French lined dark green mat and gold frame, nominal size of 31”x25”. 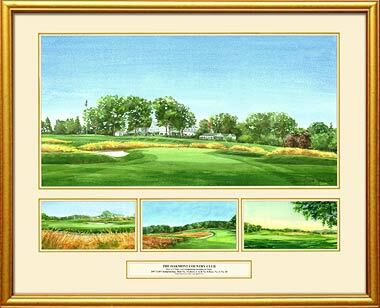 The Oakmont CC Series is shown at the top and the Shinnecock Hills GC Series is shown below. Click on the images to view enlarged versions of each of the images of the Series. Hold your cursor over the smaller images to see a larger image. Click the large image above to see a larger image of this entire frame.